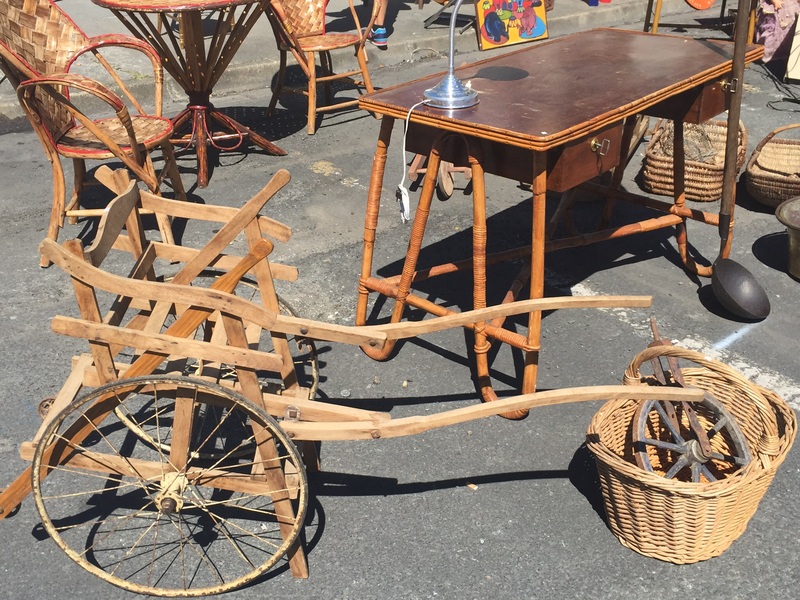 One of the popular events that we’ve read about which happens in many cities are the flea markets known as Marchés aux Puces. This morning after a light breakfast, we walked back to the farmer’s market and bought some more strawberries because the ones we bought yesterday were incredibly ripe and delicious. We also bought some haricots verts (green beans) and a few fillets of fresh fish for dinner tonight. Just before getting back to the apartment we noticed a young woman walking past us carrying on her shoulder a plaque mounted with what looked like a deer’s head. A little bizarre we thought but just then we noticed that there were lots of people milling around a short block from our street. 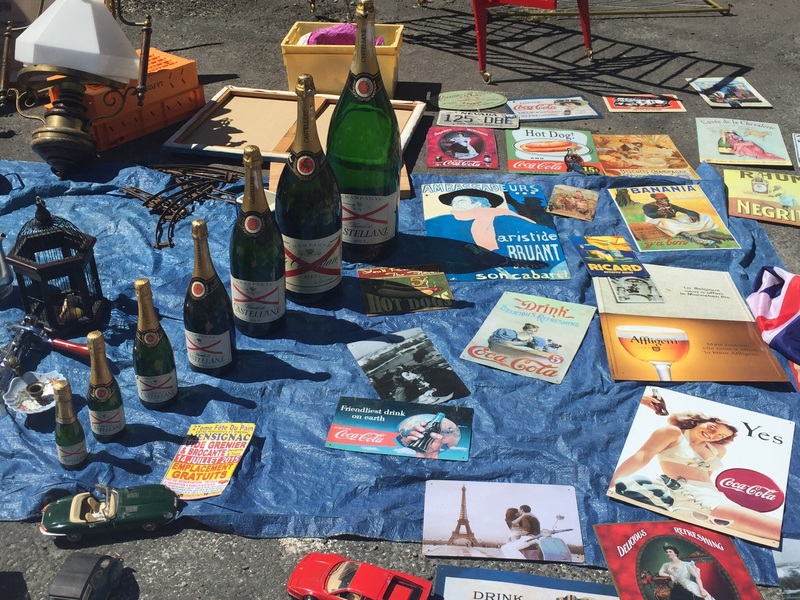 Turns out, it was the Sunday flea market. The roundabout and several streets in each direction were blocked off and a multitude of vendors were set up with their wares. It was fascinating to walk around and see the huge variety of items you could purchase. 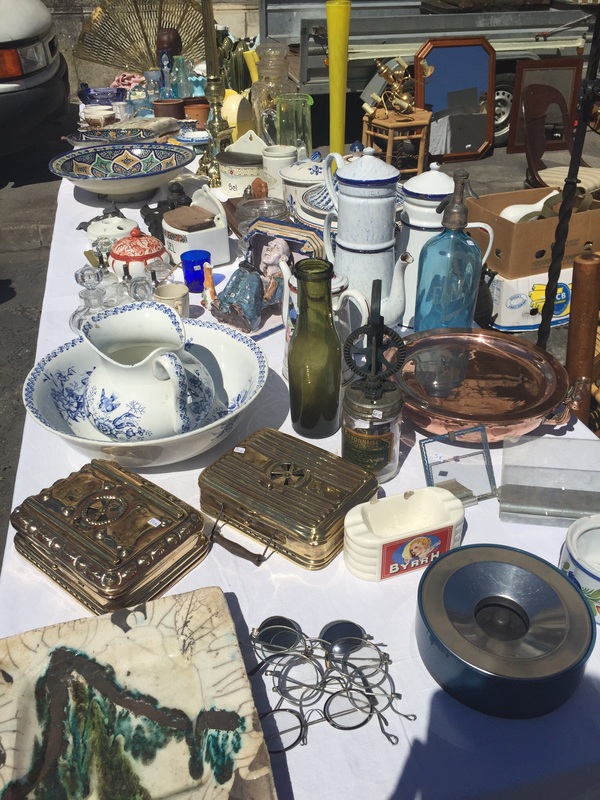 Like back home, you can find just about anything — copper pots and pans, glass and dinner place settings from simple to elegant, toys, tools, tin cups, dolls, furniture, clothing, and everything else you never knew you needed. Thank you for sharing this wonderful adventure with us! I love reading your blogs… I feel as if I am there with you!! Abiento!! So glad you are following along and enjoying our blog. We have a lot of fun sharing our experiences.